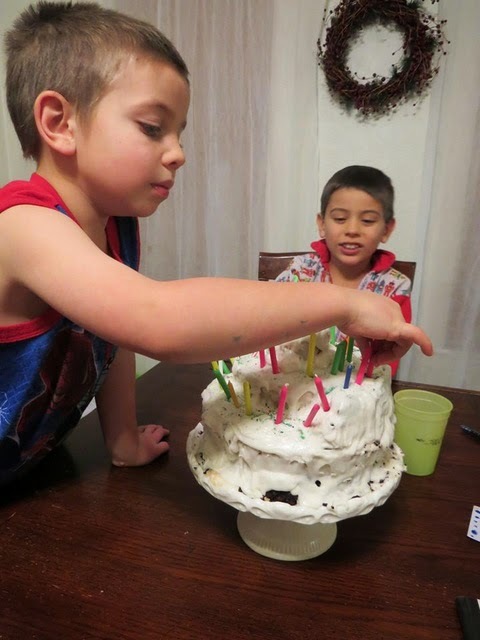 "Here is my recent pinstrosity.A birthday cake for my husband, Nehemiah. Living at approx 4000 feet I used recipes that are for my elevation. First I made the vanilla layer and it came out wonderfully. 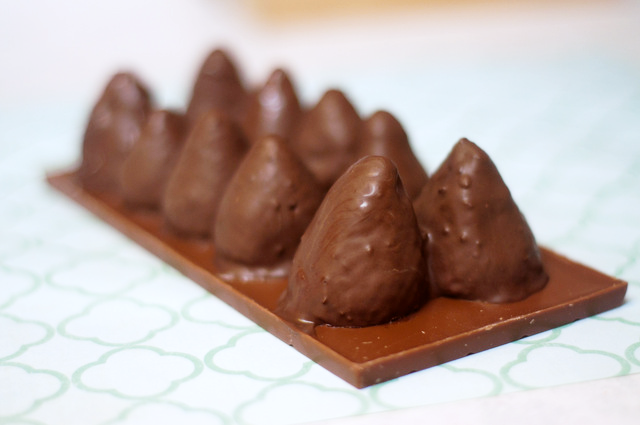 Then I made the chocolate. I forgot that my recipe calls for 9" round pans and all I own are 8" round pans. The cake rose beautifully up and over the edge nearly igniting in the bottom of the oven. 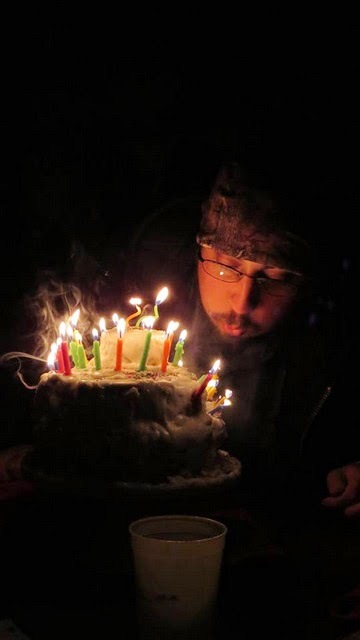 I scraped the glowing chocolate embers out and placed a cookie sheet beneath my cake to catch any more drips. After a lot of coaxing the chocolate cakes came out of the pans, but they weren't as firm as the vanilla ( crumbly chunks). I cut the rings, but couldn't lift them in one piece as I began to stack. 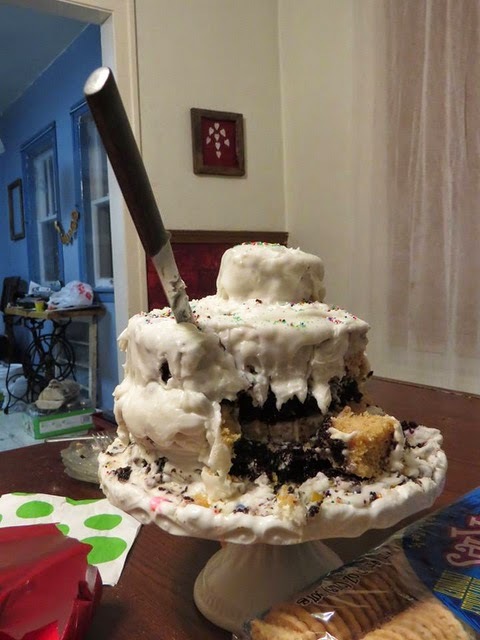 I should have used the large vanilla on the bottom as it held it's shape well, but I didn't. I don't think I have ever made a pretty cake that came out pretty, but it tasted great. Also, it did checkerboard, but my own lack of engineering skills prevailed. As one friend said: It was epic in its failure." I really really really love this photo. Nice capture Brandy! 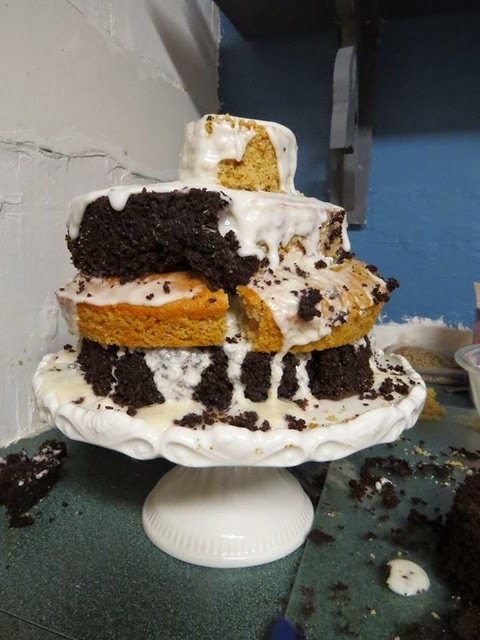 Hooray for cake...even when it's not pretty it can still taste amazing! But this intrigued me. 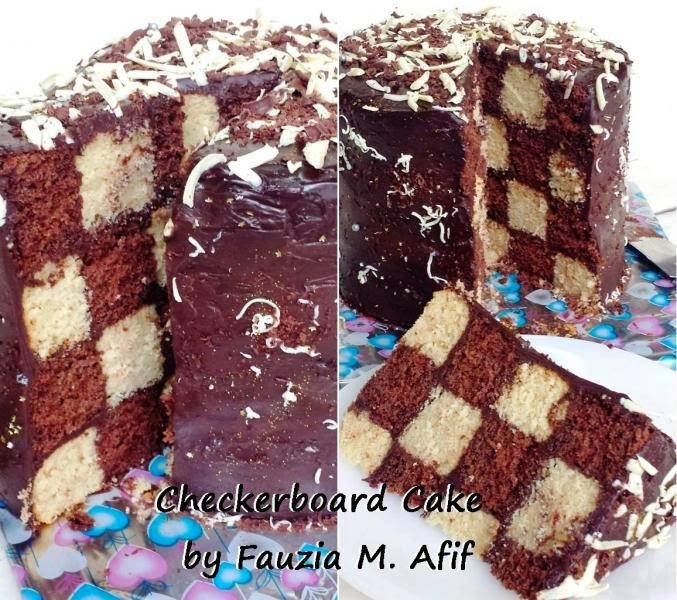 I wanted to see if it was possible to get the checkerboard cake from the original tutorial and if I could figure it out. So I decided to put this to the test. 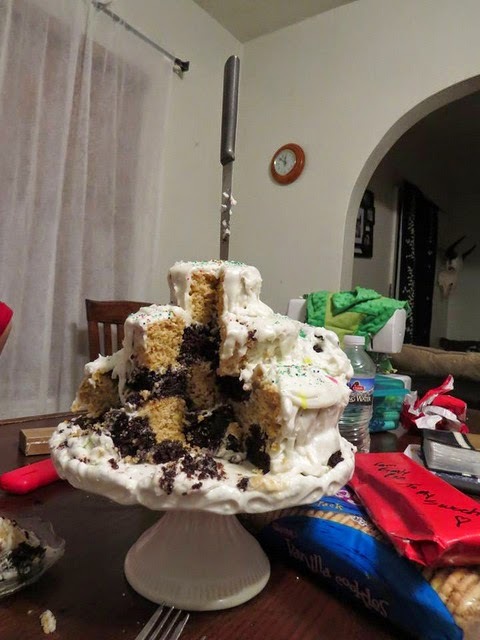 I wimped out and used cake mixes rather than mixing cakes from scratch. Step 1: I mixed the cakes up and baked them according to the box directions (completely spacing the high altitude directions -we're at 6,000 ft-but they came out great anyway). I baked them in two 8 inch pans because I wanted taller layers. The vanilla cake came out great, but the red velvet puffed up a lot. 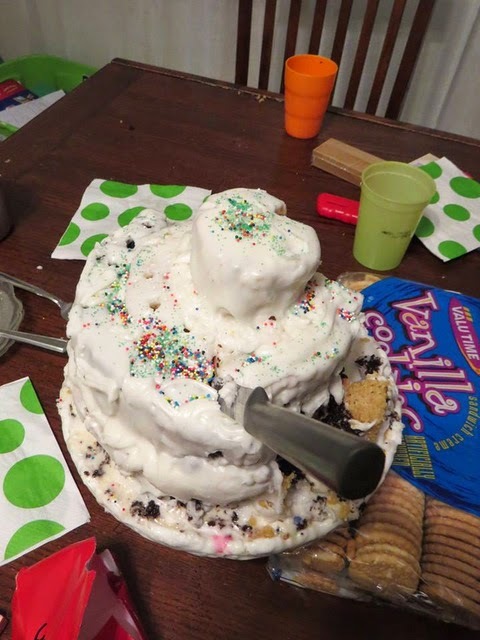 I'd recently bought a cake leveler from Walmart for $3 and used that to get the cakes all to the same level. 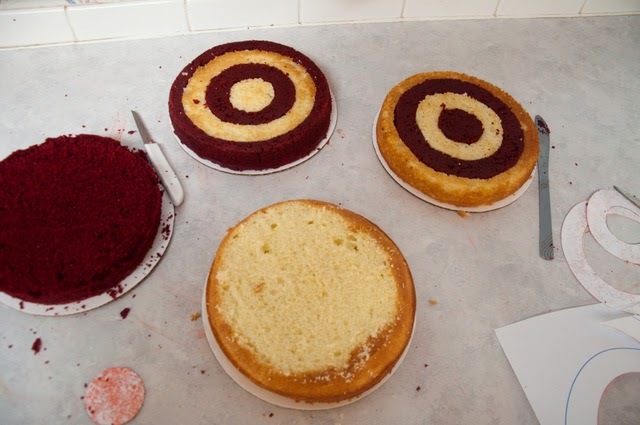 It was sad to have to cut so much off the tops of the red velvet, but to get the right checkerboard look you do need to have level cakes, and have each layer of cake be the same level. So off it went! 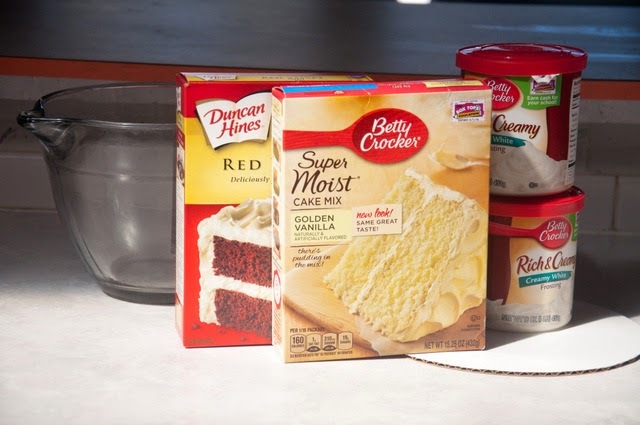 The original instructions suggest to make the cakes a day ahead, wrap them, and let them sit in the fridge overnight to help cut down on the crumbliness. I'd forgotten that part. So I stuck the cakes in the freezer for about 40 minutes. That helped, but it would have helped more if they had been able to stay in there longer. 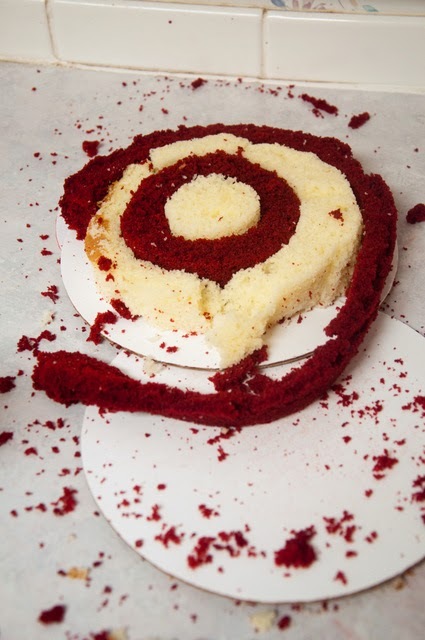 Step 2: The instructions say to take a bowl or lid and use it to make a mark on the cake and then cut a circle out with a sharp knife. I wanted even 2" circles and I couldn't find bowls the sizes I wanted. Instead I pulled up Microsoft Word and used the "Insert Shape" tool to draw circles. After you draw your circle you can right click the circle, select "More Layout Options", and then select the size tab. From there you can make your circles the right size. I made a 6", 4", and 2" circle (one inside the other to save space). 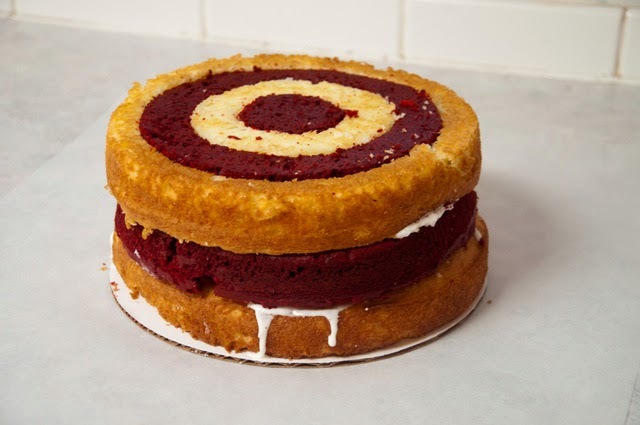 Once printing those out I cut the paper to the size of the 6" circle, laid the paper on top of the cakes, and cut the first circle. Then I cut the paper down to the 4" and did the same. The 2" circle then was done the same way. This gave me even circles. I knew that getting the largest circle without it falling apart was going to be the most tough, and it was. 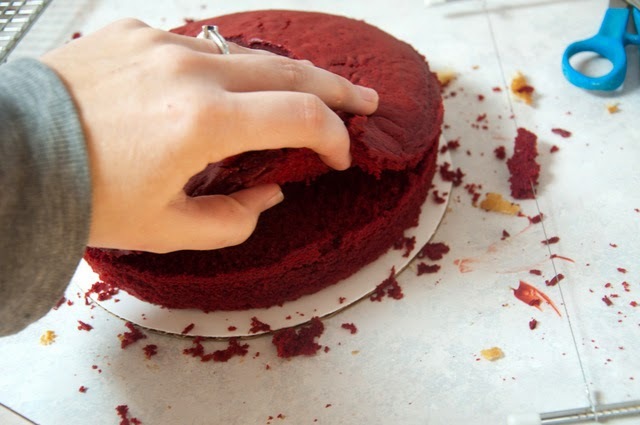 Spread your fingers out as wide as you can to give the cake layer as much support as you can and gently lift it up and out. I had 8" cardboard circles to put the layers on but you can use parchment paper, wax paper, regular paper, or anything that will let you move it and lift it easily. The inner layers were much easier to move around. I did great with three of them, but the last one fell apart. I poured the remainder of the hot frosting over the top, smoothed it out, and put it in the freezer to set for a few minutes. 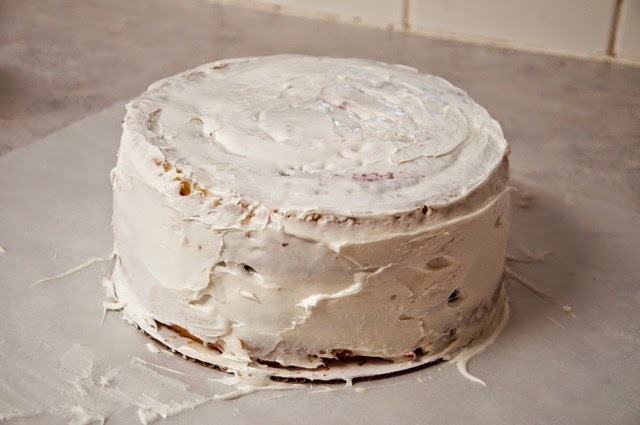 Step 5: Time to frost the whole cake. I removed it from the freezer and gave it a good crumb coat, and then put it back in the freezer. Finally I gave it a second coat, and added sprinkles. 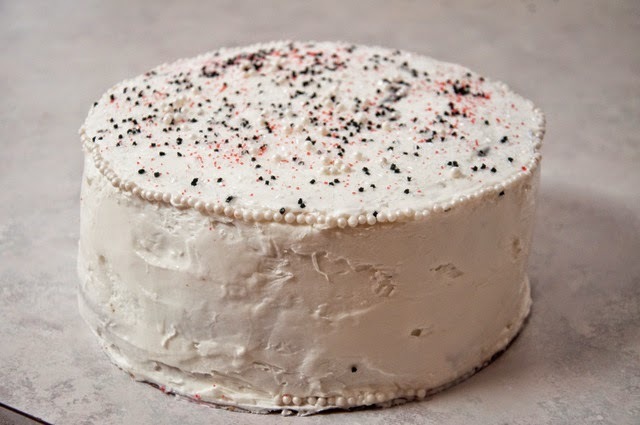 Not the most beautifully decorated cake I know, but not bad for this being my first stacked layer cake and for using the sprinkles I had on hand. It did! Not as clean cut as the original, but the DIY instructions work! This takes a lot of patience, and many trips back and forth from the counter to the freezer. It definitely had wow factor. The teenagers thought this was the coolest cake ever. Score! 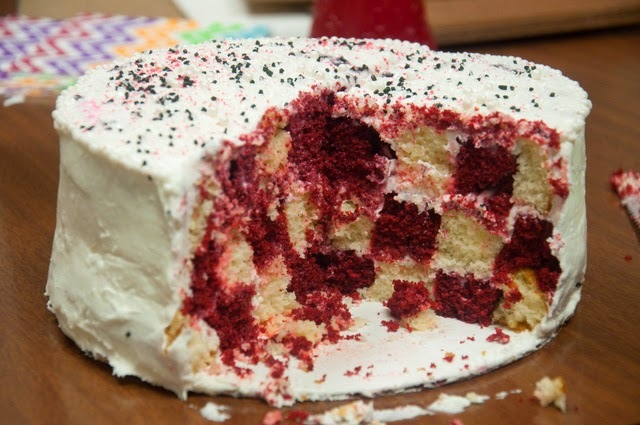 Not an incredibly easy cake, but it's doable. It is supposed to have come from this site, but I can't find it. I did find it on this site, but it linked to the first site. We got the gingerbread rolled out (adding quite a bit of flour so that it didn't stick to everything, and then got our house pieces cut out. Here is where we hit our first trouble. We couldn't lift them off the counter and onto the pan without warping the shapes. As much as we tried we couldn't get it. So we had to reshape the pieces on the pan once we got the dough over there. But, we made it work and we were still confident that they'd turn out perfect. Well, out of the oven they came and we realized this would be more difficult than we thought. First, the pieces puffed up funny. Some had rounded edges now, the cute little heart window I'd cut in one of my walls just looked like a really bad framing job, and some sizes were distorted. 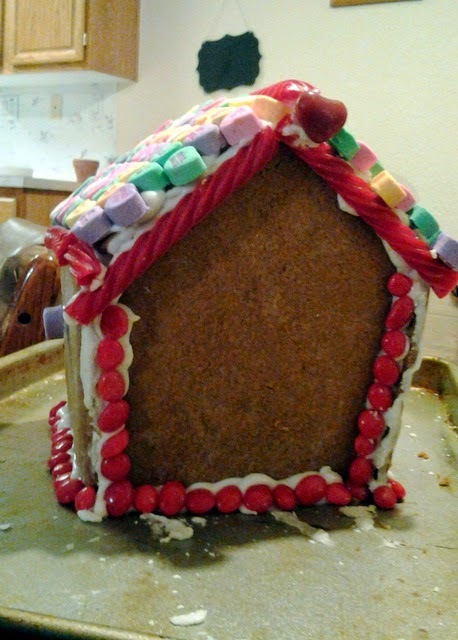 To top is off we realized we were out of dough and Cameron had forgotten about roof pieces. But...we would make this work! 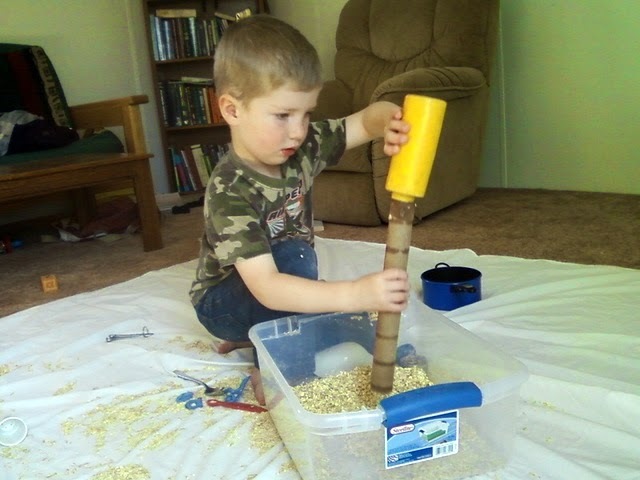 Cameron got to cutting his pieces into smaller pieces to try and reshape his house and make a roof. I got to trying to cut of edges of my house trying to make straight lines that might sort of match up. In the end Cameron scrapped his house and we worked turned my house into our house. 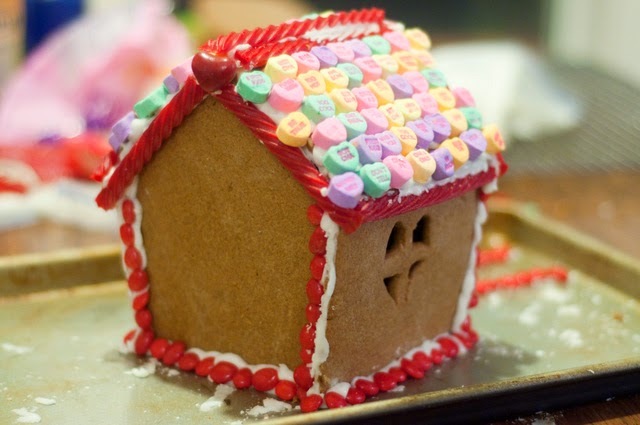 We couldn't get the walls to stay up, so one of us would hold everything together while the other slathered icing on the joints, trying to keep the house from collapsing. 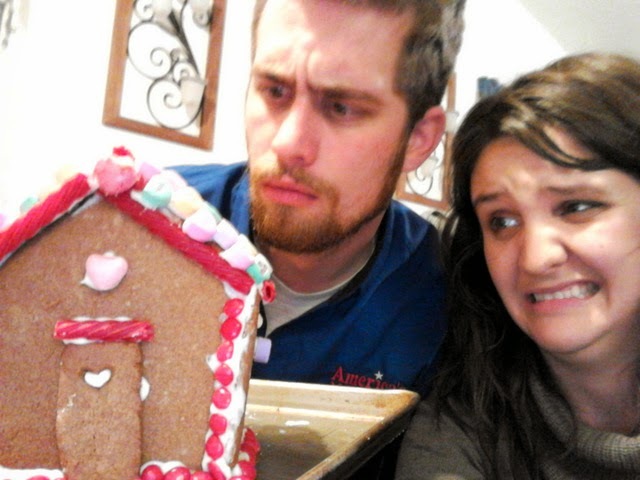 Eventually we got a semi-stable house. That is until we started adding the candy decor. The roof tried to slide off a few times, the joints shifted, and the house leaned. But finally we got it all together, the candy on, and it was upright. It was done...and we just kinda sat back and laughed. Our love shack is a little dilapidated. All in all, it's not bad...but it's not the cute little house we imagined. It's definitely a shack. Oh well. We had fun and that was the point of it, right? Right. 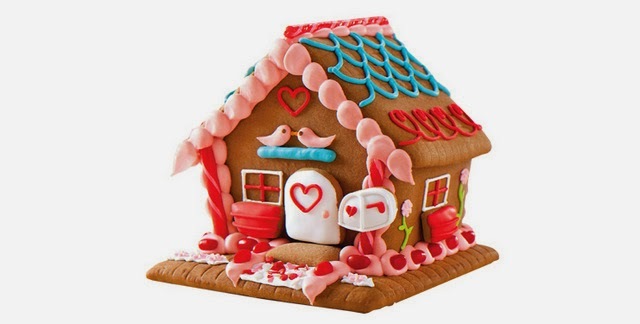 Next time I think we'll buy one of the gingerbread house kits in the after-Christmas sale and then just save it until Valentines Day. I like this pin, it looks good, but is it too good to be true?! They look so cute and bite size and is it really that easy to make cinnamon rolls?? I decided to do a pin test!! Cinna-Waffles, part of a complete breakfast. The Cinna-Waffles are the dark ones on the left, we also had original waffles and chocolate chip waffles that morning AND bacon. Amazing. Let me start off by saying these were SO yummy! They were crispier than I usually like (I like mine gooey), but we had a whole roll of cinnamon rolls cooked and ready in about 6-7 minutes (that's shorter than the time it takes to heat the oven! !I feel like that was an infomercial line lol). They tasted like cinnamon rolls and were really good! As you can see from my pictures my cinna-waffles came out much bigger than the original. I put mine in the middle of my iron and it took up part of all four waffle triangles (not pictured). I ended up putting two cinna-waffles in at a time diagonal to one another and cooking them that way, four DEFINITELY would not have fit on my iron. I think my iron is about the average size, and I used regular Pillsbury cinnamon rolls for this, I'm not sure why the original the cinna-waffles look so small?! But the pin was a success, delicious, easy to make and clean up and they were divine! Pin tested, Pinstrosity approved! Go forward and Cinna-Waffle my friends!! 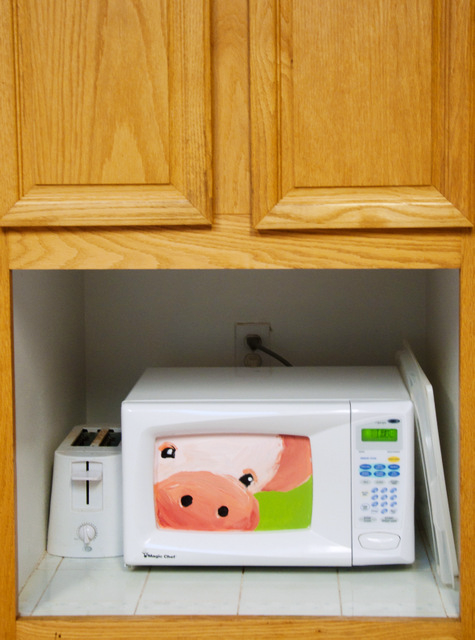 The caption usually found attached to this picture on Pinterest is something along the lines of "Genius! Put cut strawberries in an ice cube tray, pour melted chocolate over the top!" As we showed you last year though, following those instructions doesn't give you quite the same results. We did however give you some tips as to how we thought you could recreate the original picture at home fairly easily. The only catch was, we'd never tried our tips. We thought they would work, but we didn't know 100% for sure. So this year I decided to revisit the old Pinstrosity by testing out the tips we gave you. Lucky for us, it worked! Mine didn't turn out as beautiful as the original, but as he is a professional and I'm definitely an amateur, I'd say this isn't too bad! I opted for Lindt because I wanted a candy bar with large squares rather than the small rectangles of a Hershey's bar. I'm not a huge fan of dark chocolate so I asked Cameron to pick up a milk chocolate bar for me. 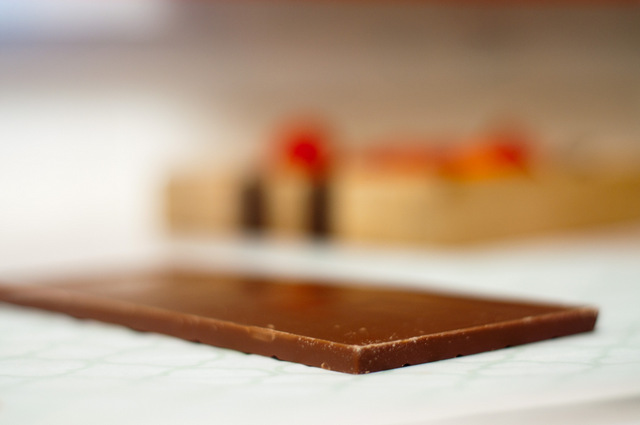 Apparently it's just a thing with milk chocolate to form it in the small rectangles. If I do this again I'll get dark chocolate (ooh! 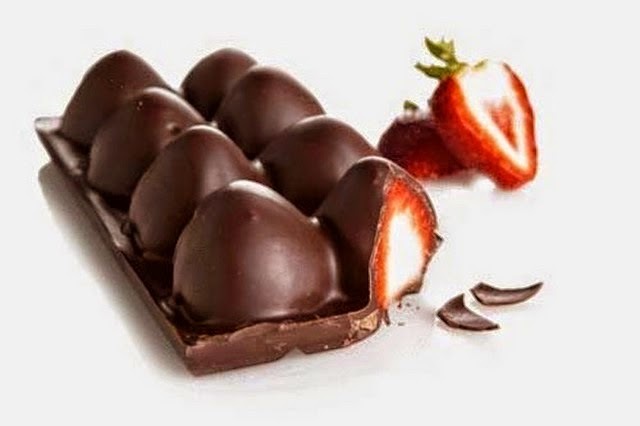 or maybe the raspberry or strawberry filled chocolate) so that it's in the large squares that will be easy to break off. Oh well. I'm partial to Almond Bark, but some are partial to Wilton's candy melts. I tried to pick ones that were all close in size and which had the prettiest shapes. 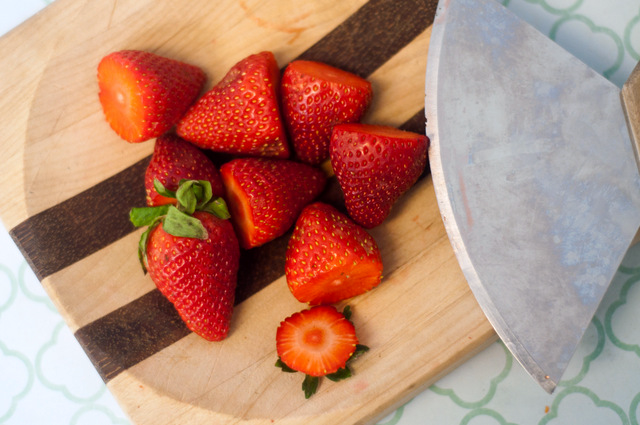 To start, cut the tops off of your strawberries. I laid out parchment paper on the counter to make clean up easier. 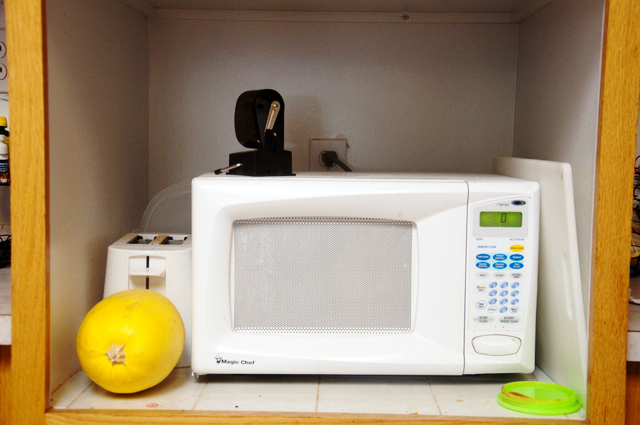 You can use regular paper, wax paper, or even tin foil if you want. Unwrap your bar and place it bottom's up on the paper. Melt your chocolate according to the package directions. I used 2 squares of the almond bark and it was more than plenty. Drop in your strawberries one at a time and roll them around gently with a fork until coated evenly. Tip the strawberry point up and scoop it up by sliding the fork underneath. 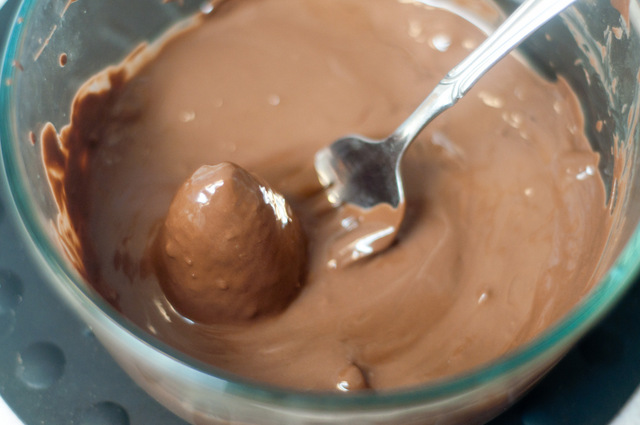 By using a fork the excess chocolate can run off easier. If I do this again, I think at this point I'd place the chocolates on the parchment paper to let the chocolate set and then dip them at least one more time to get more of a smooth finish. 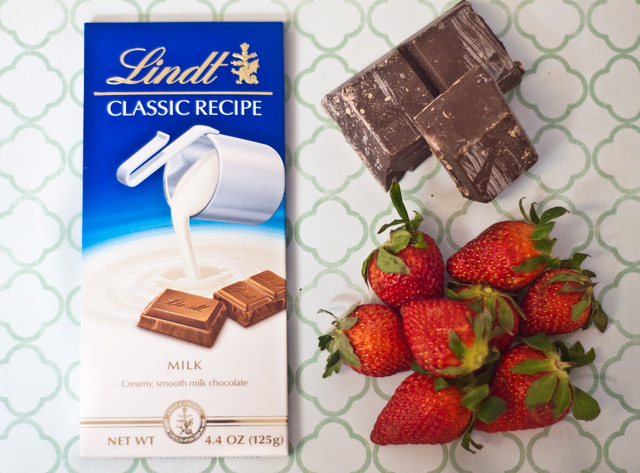 Whether you dip it once or multiple times, once you are done dipping a strawberry, place it on the chocolate bar to set up. 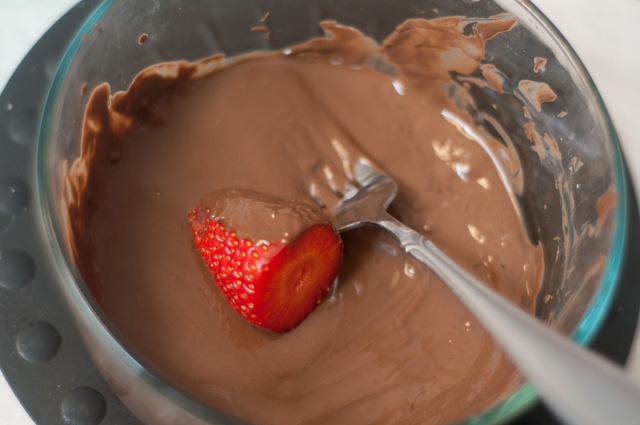 Repeat until you've filled your chocolate bar and/or used all your strawberries. See how you can still see the strawberry texture in the photo above? That's why I would go back and redip them a 2nd time if I were doing this again. My creation didn't turn out as beautiful, but my strawberries were pretty pointed and definitely not uniform. More dippings could help minimize the pointed tops. All in all though, this really wasn't too bad. It came together in about 6 minutes. 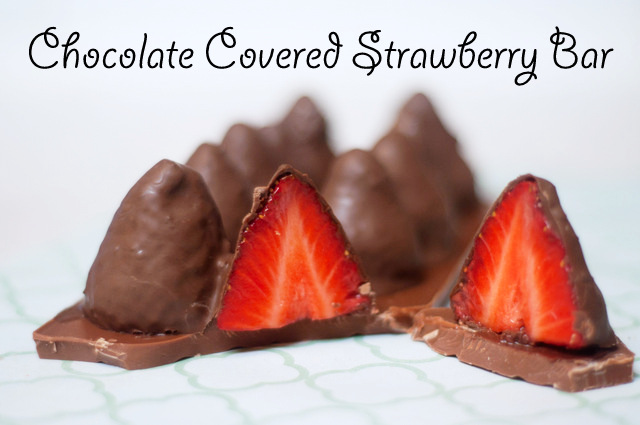 The strawberries adhere to the chocolate bar really well, but not so much that they are tough to pull off and eat. I was hoping to be able to break off one square at a time, each with its own strawberry on it, but that didn't quite work out this time around. It's still fun though! 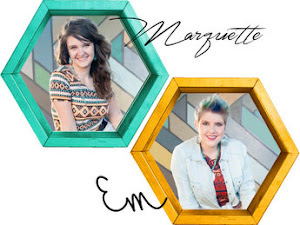 Today I have all of the "A is for..." January challenge projects! Food, art, and fun! We'll start with the first one sent to us! "I've never, ever made alfredo from scratch for some reason, so the January "A" Challenge was perfect when I decided the other day that I was craving some alfredo sauce at home. This "Chicken Alfredo Baked Ziti" pin made it sound easy and had great photos too. My kiddos pitched in with the preparation and it turned out pretty great. We omitted the parsley flakes, and used rotini instead of ziti... and we may have been a little overzealous with the amount of noodles we added, because it was a little dry if you like your noodles saucy. (This was likely from too many noodles cooked up by my almost-4-year-old-helper.) The alfredo sauce itself was creamy with a good flavor. Night one was a success! For leftover night, we added some alfredo-from-a-jar upon reheating in order to make it saucier, which helped a lot. We will save this pin and try again with extra sauce on the first night. Happy "A" challenges! 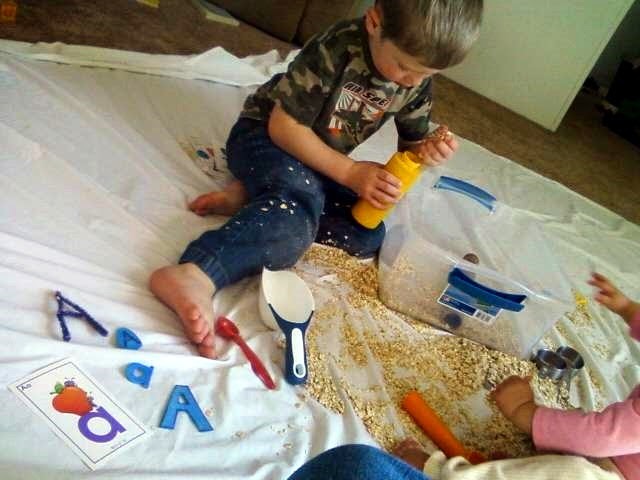 -Kate"
Diedre decided to take the "A is for" theme literally and recreate a pinterest pin of a whole learning experience for her 3 year old son about the letter A. 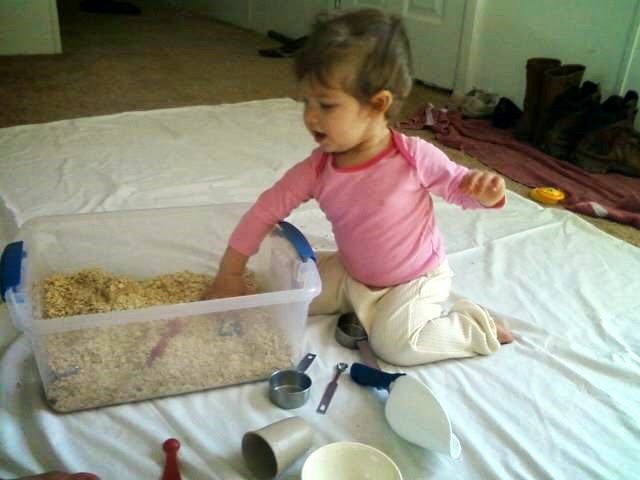 She explains the sensory bin and how she put it together on her blog. You can see more of my process on my blog as well. And there you have it! Those were all the "A is for..." projects we were sent. Fun, huh?! I love seeing creativity and courage come together with trying out these pins you find! Way to go everyone! Many of our Pinstrosities happen when directions are missed or there are substitutions made in the supplies or ingredients. Sometimes though a pin is just hard and it makes you sweat. Lexidh found one of those pins and gave it a good run. 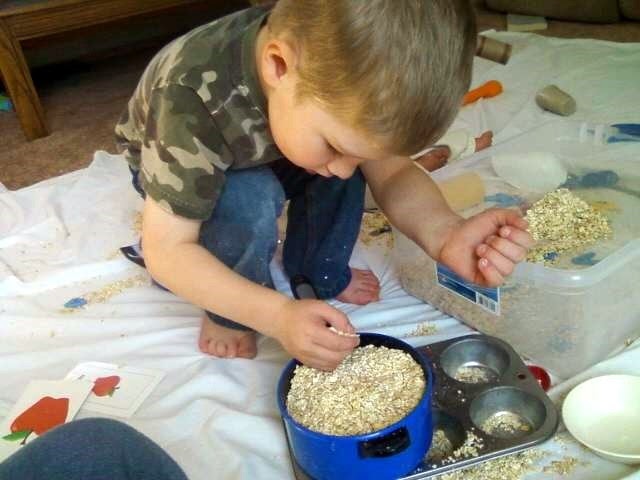 "I decided to try the [above] pin, making clay bowls. Looks so easy, doesn't it? And the instructions on the page are so clear, right? Wrong. Instead of using one stamp over and over again in a pattern (something I'd mess up at once), I used a big background stamp. Other than that I followed the instruction to the letter, even bought the right brand of clay (from Greece!). Didn't really go so well as I'd hoped... "
"First I tried with two bowls, one of which was too big to make a small bowl inside... "
"Can't put much in it without it going over the sides ;P"
"So, kinda my bad. But as you can see from my other try, don't think that 'overnight' or even 'next night' or 36 hours is enough time in a warm, dry room (my hydrometer doesn't even want to measure how dry it is in my crafts room), if you take it out and flip it over to dry upside down the bottom will sag, and you end up with something roulette-board-shaped... It just drops down in the middle!" "But I'm a stubborn lady, so my next try went much smoother." 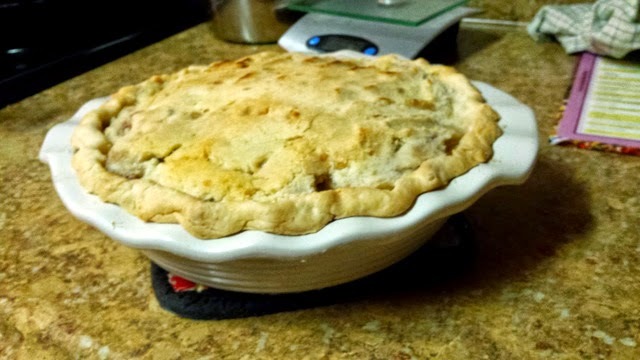 "I used a paper dessert bowl (not coated with plastic) to shape and dry it in. It didn't stick to it at all, just dried evenly and stayed in it's shape. It took a few days, but it's worth it! After sanding down the edges I sprayed with a few layers of clear lack, which gave it a better finish, and it isn't so prone to leave marks on stuff. The finished product isn't smooth, but it doesn't feel like you could use it as blackboard chalk." "I'm very pleased with the end result, but the original pin has a few pitfalls, as they often do." Even when you follow the directions, some pins can be tough. Some of them take a little thinking through to make sure it'll work out (as with the right size of bowls for Lexidh's first try). I'm so glad Lexidh kept pressing on though and worked to figure this out! I really really want to try this out. I have this battle going on in my head right now. I thought the clay would be super expensive, but it's only $7.61 on Amazon. So that didn't work as excuse to not do this. I'm in the middle of a HUGE decluttering campaign in my life and I'm being extremely picky with what I buy and bring into the house when I'm trying to get so much out of the house. 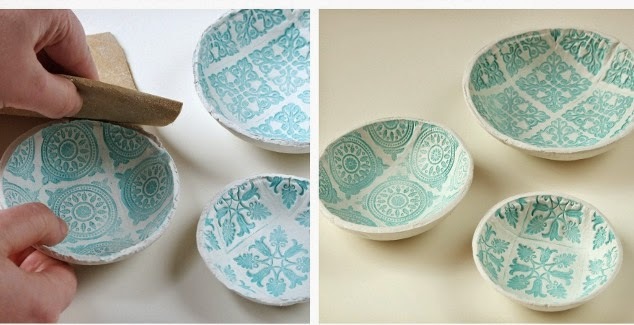 I don't have an immediate need for these bowls, but they look so fun! Maybe I can come up with a need...but probably not.